Sometime around 1990, I got to meet my dad’s aunt Frances. He hadn’t seen her in about thirty years; we met her in Edmonds, Washington at the condominium of my grandmother Irene (affectionately known as “Mimi”). I remember the evening very clearly; she talked a lot about writing her memoirs, and about my great-great-grandfather, Theodore H. Barrett, who had commanded a battalion of African American soldiers for the North in the Civil War. (Not having seen it yet, we briefly wondered if perhaps the movie Glory had been about him.) It turned out that a small town in Minnesota had grown up around the ranch Theodore had built after his military service, and was named for the general. Shortly thereafter, Frances passed away, but I never forgot that evening. Seven years ago, on my way from Seattle to Bloomington, Indiana to re-start my junior year at the IU School of Music (it wasn’t yet called “Jacobs”), I made it a point to pass through Barrett. It’s about two hours or so west of the Twin Cities, and somewhat off the beaten path, but as I had never had a reason to go to Minnesota before and wasn’t sure when I would have another, I wasn’t going to miss the opportunity to connect somehow with my family’s past. 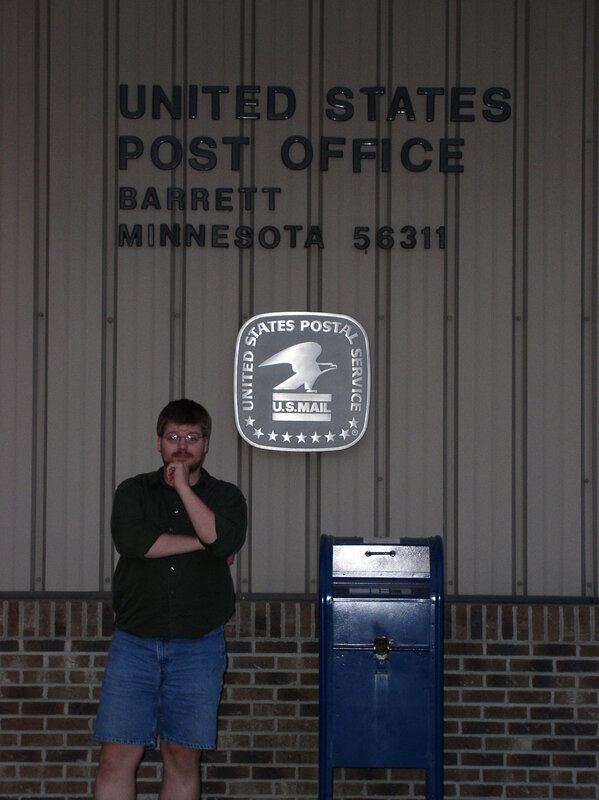 There wasn’t exactly a ton to see, particularly since it was past business hours and getting dark, but I was able to get a picture taken of me in front of the post office. I had always been curious to know if I had any relatives still in the area; the phone book didn’t show any Barretts still nearby. I would have stayed there for the night, or at least stopped and had dinner there, had there been any places open that offered that kind of service, but alas, nothing seemed to be operating. A couple of weeks ago, I discovered that Barrett, Minnesota had a website. It didn’t mention anything about the history of the town, but links concerning the Old Settlers’ Reunion and the Historical Photo Project piqued my curiosity. I sent the city office a note identifying myself as a descendant of the general’s, asking if they were going to have any exhibits about Theodore or his life, and if they had any information about other descendants. I got a very nice reply from Marita Rhude in the city office, and she put me in touch with Patricia Benson of the Grant County Historical Society. She sent me a scan of a handwritten document provided by none other than my dad’s Aunt Frances that detailed everything about Theodore’s descendants, as well as several photos — of him, his estate, and some of the tribe. One thing that was immediately clear is that the reason why I wasn’t finding out much about Barretts in other branches of the family is because, well, there wasn’t really much to know. Richardson Damon’s son Roger had a daughter, Deborah; Theodore’s daughter, Georgia, had no children. 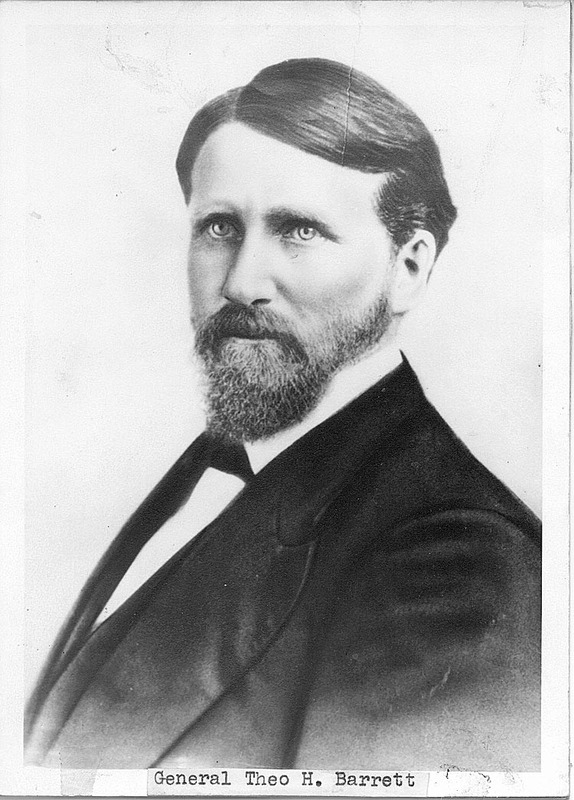 Theodore Sedgwick’s three children were my grandfather Jack, my dad’s aunt Frances, and then another son, Theodore Sylvester. Frances married and had two sons and a daughter; Theodore had no children. The sons of Jack’s sons, that is, myself and my uncle George’s sons, represent the last generation of Barretts descended from Theodore. There is no “greater Barrett family” outside of those of us descended from Jack. 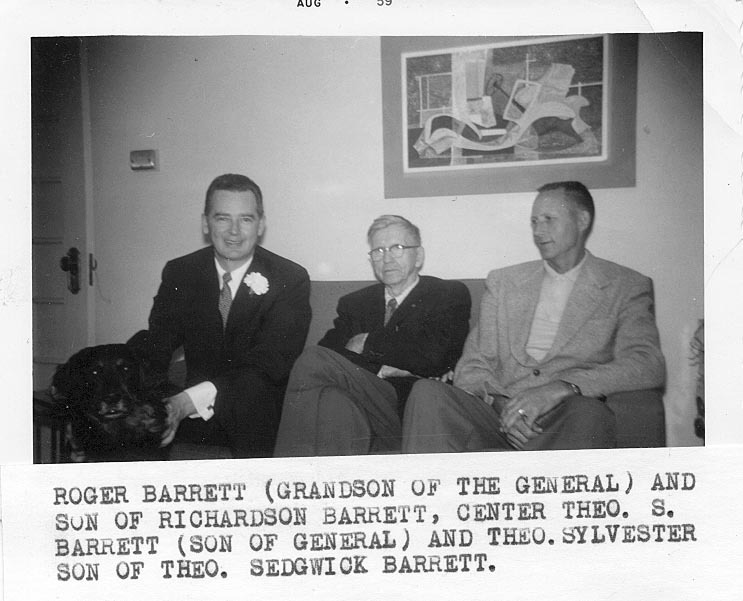 One of the pictures Ms. Benson sent me that was remarkable is from 1959 — it’s my dad’s grandfather, Theodore Sedgwick, his son Theodore Sylvester, and Richardson Damon’s son Roger. What strikes me about it is that Roger and Theodore Sylvester both unquestionably look like Barrett men to me. Roger looks a lot like the pictures I’ve seen of my grandfather Jack, and certainly bears a strong resemblance to my dad and my uncle George. 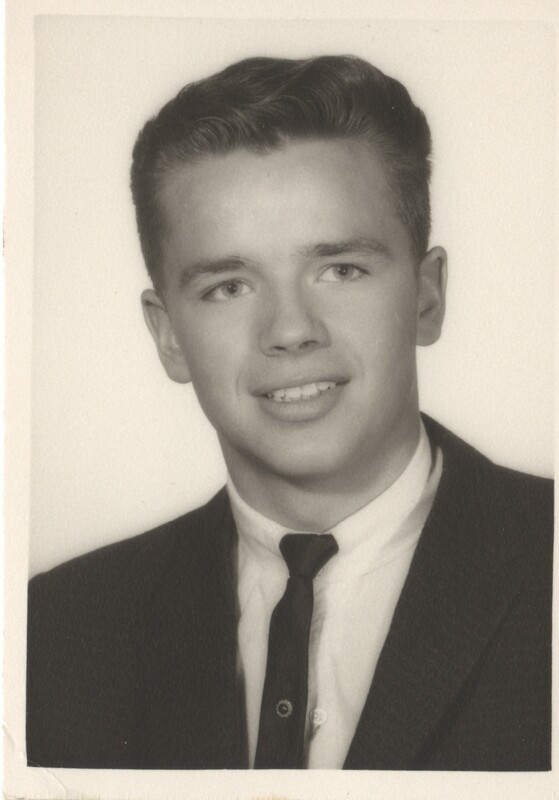 My dad’s senior picture is posted here so that this might be obvious. Theodore Sylvester also has that going on, and curiously enough he also looks a lot like my aunt Pip, the youngest of my dad’s sisters. I’m in the processing of circulating all of these photos to my family — my dad says that he only met his grandfather Theodore once, when he was around 13 years old. He was already blind, and he thought that Dad was my uncle George. Georgianna, Theodore’s wife and my dad’s grandmother, had died when she was still quite young, and none of the kids ever met her. Beyond that, it seems he never knew or heard about any of these people. It sort of makes me wonder how intentional that may have been — did Jack head up to Alaska to get away from his family? Hard to say, and I’m not sure there’s anybody left alive who can help fill in the gaps. I’d really like to thank Marita Rhude in the Barrett city office and Patricia Benson of the Grant County Historical Society for their generosity and their time, and I’d also like to encourage anybody with a mind to do so to help out with the Historical Photo Project. If you stumble across this blog post and discover that you know anything more about these people or this place, I’d love to hear about it; drop me a line at rrbarret (AT) indiana.edu.